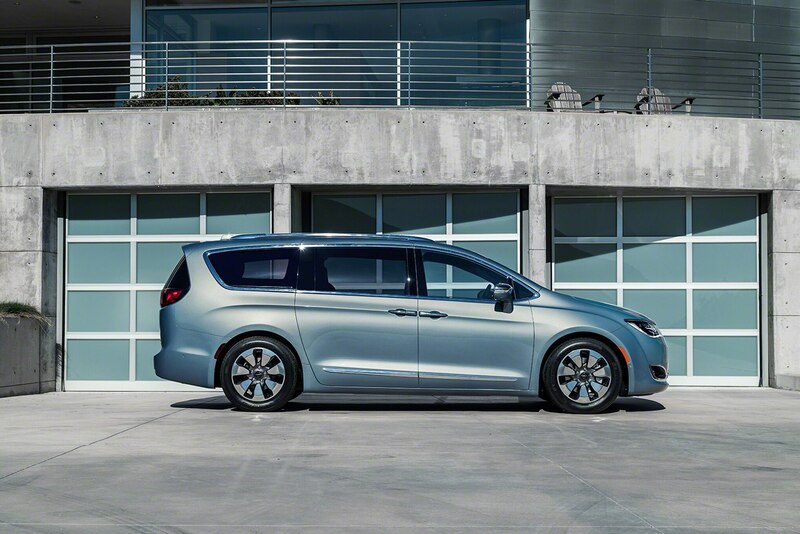 The Chrysler line-up grows with the Pacifica Hybrid. It delivers seamless and efficient driving experience. It can get up to 33 miles of all-electric range with a total range of 566 miles on one tank of gas. It gets a dual-motor eFlite EVT with the upgraded modified 3.6-liter V6. Even with the battery, space is not compromised because it is stored away under the second-row. The technology in the Hybrid includes a smartphone app that will let you know the charge status and scheduling, charging station locations, and even an "efficiency coach" that shows you how to be a more efficient driver. There are so many more features in the Chrysler Pacifica Hybrid so keep reading below. The Chrysler Pacifica Hybrid is gets its electric power from a 16-kWh lithium-ion battery. Once the battery power is depleted the minivan turns into a part-time electric vehicle. The wheels are powered by the electric drive system or supplemented by an adapted version of a 3.6-liter V6 engine. The battery is hidden away under the second-row floor in a unique battery case. The technology behind the Pacifica Hybrid is an eFlite electrically variable transmission. The EVT features two electric motors that both can drive the wheels. It uses a one-way clutch that allows the motor that typically is used as a generator to deliver torque to the wheels. The Pacifica Hybrid also includes a regenerative braking system that will convert kinetic energy to electricity. With this braking system, it provides additional range. When the minivan decelerates from a higher speed the motor becomes a generator and charged the battery. It can be fully recharged in two hours when using the 240-volt plug-in system. The Pacifica Hybrid is sculpted as an athletic looking minivan. This minivan gets sliding door track lines that are hidden under the rear quarter of the side glass, making them virtually invisible. The Hybrid has a unique front grille pattern and wheel design. It also comes with distinctive badging and has an exclusive Silver Teal Pearl Coat paint. There are also ten other exterior colors available to choose from: Billet Silver, Brilliant Black Crystal, Bright White, Molten Silver, Velvet Red, Jazz Blue, Dark Cordovan, Tusk White, and Granite Crystal. The interior is spacious and includes plenty of advanced technology. It offers the Uconnect Theater entertainment system, 8.4-inch touchscreen, 7-inch full-color driver information display, and multiple Uconnect Access features. There is an available tri-pane panoramic sunroof with dual-pane panoramic sunroof over the first two rows and over the third row with fixed glass plane. With this sunroof, it makes the minivan feel even bigger. Do you have any used cars at East Hills? Can I get any tax credits with the Pacifica Hybrid? The Chrysler Pacifica Hybrid comes with 100 available and standard safety and security features. For the first time on the Pacifica, there is a Surround View camera that uses four cameras positioned around the vehicle. This provides 360-degree views, including a bird's eye view. The parallel/perpendicular park assist will use ultrasonic sensors to guide the minivan into the parking spots. Other features that are standard are blind-spot monitoring, rear park assist with stop, rear backup camera, electric park brake, and electronic stability control. Come down to East Hills to check out the 2017 Chrysler Pacifica Hybrid!